To start monetizing with ironSource, you must provide your company or individual information and sign our Terms and Conditions. New! You can now activate our ad units without entering your payment details. However, to receive payment for your monetization efforts, you will need to provide your payment information as described here. You will need to enter the details of your Company’s information before you can define your preferred payment method. Note: You must enter these details as they appear in your bank records. Some of this information will not be able to be altered after initial setup. If you need to change them, please contact us. Lastly, once you’ve carefully read the Terms & Conditions, check the “I agree to the Terms and Conditions’ box and select ‘Sign & Save‘. Important! 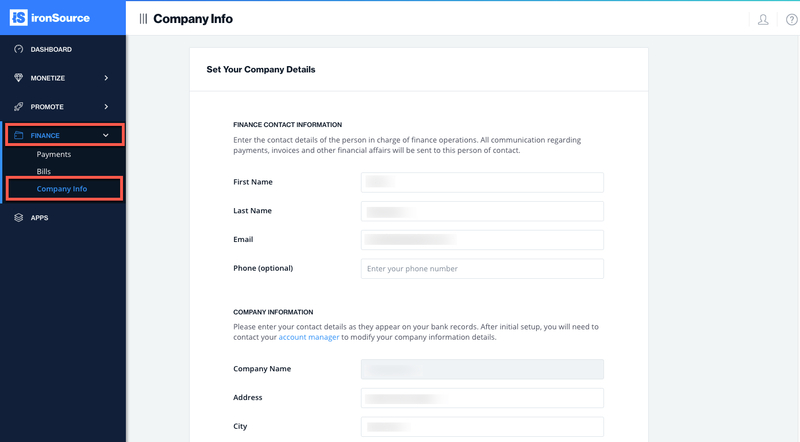 Once you have deposited funds to your account or switched one of the ad units to Live mode you will not be able to edit your company’s name and country. Make sure you have set the company’s legal name as the company name and the correct country. Set up your payment details as described here to enable payments to your preferred payment method. Inserting your payment details is mandatory in order to switch your app(s) from Test mode to Live.